These stamps are rubber and repositional. Wow!!! They are great! This is Inkadinkado's new Wackytac repositionable adhesive---clings to clear acrylic blocks no matter how many times you use it. No glue or messy residue. Printed labels and contour-cut stamps allow for more precise placement of images. Stores easily on the enclosed backer sheet or in the Clear Boxes that I sell.The stamp set sells for $12.95. Please e-mail me if you would like to purchase this set of stamps. I will need your mailing address and your preferred payment plan. I accept Visa, Master Card and PayPal. 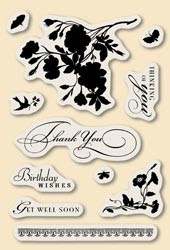 Please check out my card where I used this stamp set. All comments will be welcomed!